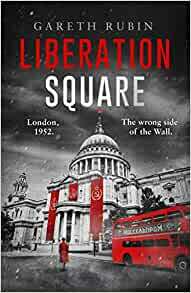 Start reading Liberation Square on your Kindle in under a minute. On the Soviet side of the wall, Jane Cawson calls into her husband's medical practice, hoping to surprise him. Instead she detects the perfume worn by his former wife, Lorelei, star of propaganda films for the new Marxist regime. Jane rushes to confront them, but soon finds herself caught up in the glamorous actress's death. Nick is arrested for murder. Desperate to clear his name, Jane must risk the attention of the brutal secret police as she follows a trail of corruption right to the highest levels of the state. 5.0 out of 5 starsTwo books for the price of one! Both a superb thriller and a thought provoking alt-historical novel. Plot twists and turns kept me on my toes: Rubin deftly steers his readers down different avenues, building our empathy with key characters only to tease and test our loyalties later in the story. At the same time, clever use of real historical characters in his tale provides food for thought. Great book, thoroughly recommended to anyone who enjoys a good whodunnit, but likes to think for themselves too! Couldn’t put this down from the moment I started it! Very clever twist of history and a storyline that’ll keep you guessing until the end! 5.0 out of 5 starsThe writing is spot on and the plot is flawless. I have always enjoyed alternative histories and this is something a little unusual. There are lots of novels where the Germans won the Second World War, but this book takes things in a slightly different direction. Imagine the Germans won and were then overthrown by the Russians, leaving a wall which goes right through London and splits the country in two. To the North, the Americans look down on a battered, war torn city, which is slowly re-building itself. To the South, the Russian occupy the land. Part of this country is recognisable, while other sections are different. It is 1952 and those in power include Anthony Blunt and Guy Burgess, while Teddy Boys lurk outside milk bars, rationing, as it was despite actually winning the war, was very much in place, the Royal Family are in Scotland and George Orwell was re-educated after a book set on a farm, but is, at least, still alive. Into this city we meet Jane Cawson, married to a doctor, Nick, for just six months. She is more concerned with personal matters, than political ones, believing her husband is having an affair with his ex-wife, actress Lorelei, the beautiful star of propaganda films. When her husband is missing from the office, she fears he is with her and storms around to her house, only to find her dead. This leads to Nick being accused of the murder and Jane, along with British policeman, Sergeant Frank Tibbot, investigating the crime. This is something between a crime and a spy novel, with Jane investigating a world which is full of lies and secrets. It has an interesting premise and the author has created a believable, alternative scenario. I received a copy of this book from the publisher, via NetGalley, for review.